Do you want to repeat code blocks? To repeat code, the for keyword can be used. Sometimes you need to execute a block of code more than once, for loops solve that problem. We specify the start and end of the loop using the function range(min,max). but will output 0 to 9. 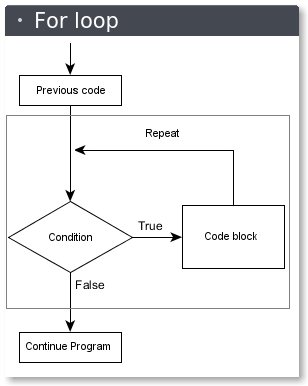 The code is repeated while the condition is True. In this case the condition is: i < 10. Every iteration (round), the variable i is updated.